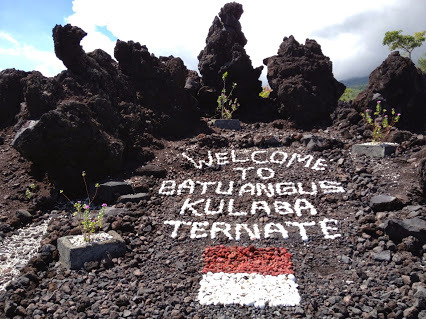 Batu Angus is a pile of leftover from lava eruption of Mount Gamalama which has been turned into a stone that looks like a stone charred; it located at the edge of the highway about 10 km from Kota Ternate. In addition to presenting the lava that has become stone, from this place tourists can see the summit of Mount Gamalama and azure Ternate. Moreover, at Batu Angus there is a historical site that commemorating the death of a Japanese soldier who was killed by his parachute that did not open normally during his jumps from planes in 1945. Uniquely, the rocks at this place are black like scorched. Reportedly, the Angus stone are the remnants of lava eruption of Mount Gamalama in the 17th century, precisely in 1673. This location is suitable for those who love photography with exotic background of Gamalama Mountain. The greenish situation and the bluish ocean is can be seen at the peak of Batu Angus. We can see the rumble waves around the beach beneath the location, and that make dramatic nuance when visitin this place. The location of this place is settled in almost 10 hectare and the perfect time for visiting this place is around 4 PM or at dawn, in order to avoid the bright sun and the temperature that too hot. There will be food stalls around the place and become your rest area while enjoying the situation. For those who love camping, we can make our tent here and make bonfire to enjoy the night situation around the place. Because it located at the edge of the town, it makes Batu Angus easy to reach. The highway that passing through this place is designed uniquely, just like a branch. Hence, when we are heading to this place, we can enjoy Batu Angus at the right side, while at the left side we can see the grace of Gunung Gamalama.